The Hawaii sustainable transportation forum provides stakeholders of various transportation sectors discussion opportunities to ensure that environment, social, and economic considerations are factored into decisions affecting transportation activities that can be sustained into the indefinite future without causing irreparable harm to future generations of Hawaii. 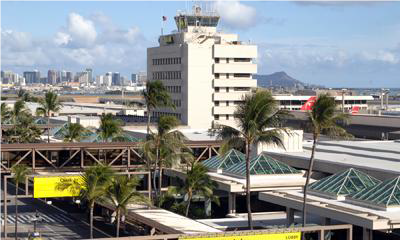 Airport Energy Savings Program12 state airports will be modernized with the latest in energy-efficient and green technology to cut energy use by 49-percent, saving at least $518 million in energy costs, over the next 20 years. The project will replace 372 transformers and 74,500 light fixtures, install 9,100 solar photovoltaic panels; and include upgrades and replacements of chilled water and air conditioning systems and installations of smart controls. 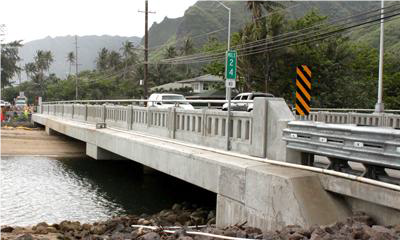 Kamehameha Highway Bridge Replacements The 85-year-old North Kahana Stream Bridge and the 86-year-old South Punaluu Stream Bridge were replaced with new concrete structures that meet modern construction and highway safety standards at a cost of $13.3M and $14.6M, respectively. Both bridges were also widened to provide larger shoulder lanes for vehicle breakdowns and improve pedestrian and bicycle safety. 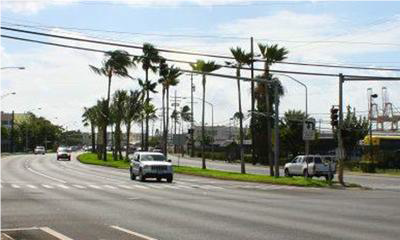 Fiji palms, 163 coconut trees, two acres of Saint Augustine grass and a new irrigation system were installed over 1.25-miles of Nimitz Highway between Sand Island Access Road and the vicinity of Alakawa Street to beautify one of the main corridors used by visitors from the airport to Waikiki. Sustainability, durability and the creation of a unique Hawaii sense of place were key design elements at a cost of $1.3M. Looking for additional sustainable transportation resources? How much oil is used in Hawaii?